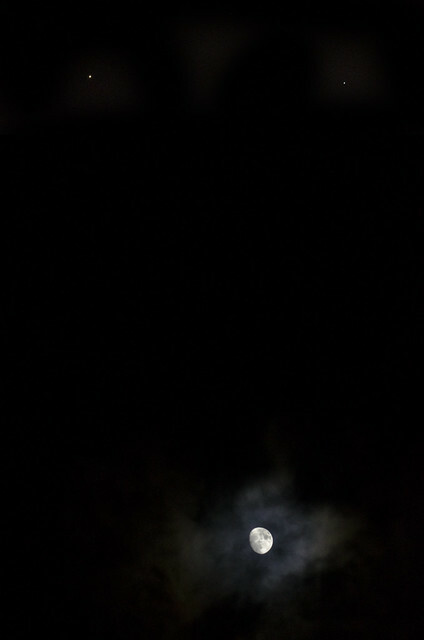 One of the things that really frustrates me about photographing the moon is getting the camera settings right. OK, it’s not that big a deal but every time you touch a big zoom lens to make an adjustment there’s a degree of shake introduced, even with exposure delay set to on there’s still a chance the camera won’t have settled by the time you take a shot. It’s tempting when experimenting with exposures on a subject like the moon just to quickly change the shutter speed and hit the remote, especially if there’s cloud in the equation where exposure times can change from second to second. What you invariably get are shots that look ok on the preview but on closer inspection are slightly blurred. No good to anyone. 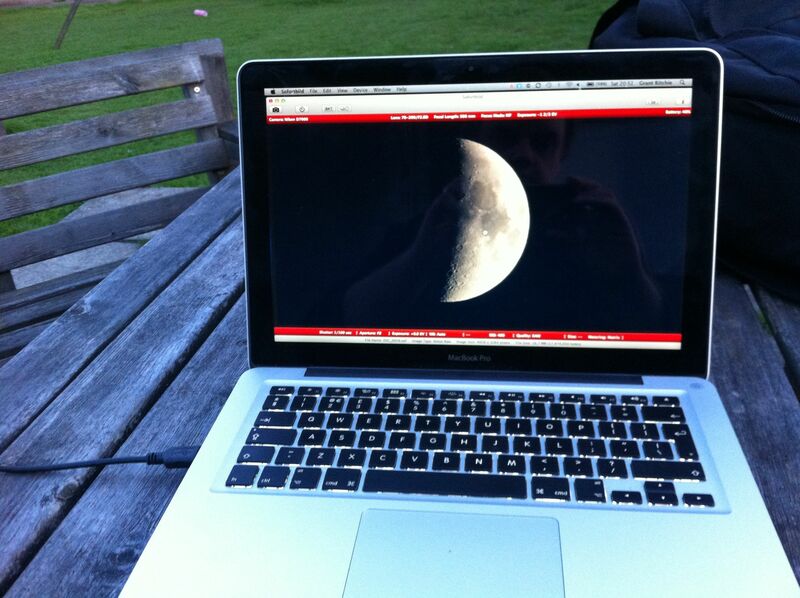 The solution I’ve found, where it’s convenient anyway, is to tether the camera to a laptop. Most modern DSLR’s should be capable of being controlled remotely from a laptop and there’s a range of freeware out there to help you along. For this example I’m using Sofortbild on a MacBook Pro tethered to my Nikon D7000. When connected to the laptop the camera show’s this on its top screen and all settings are now changeable directly from the app window on the Mac. Sofortbild is a Nikon only Mac based app but there’s stacks of options out there for all models. Other than the laptop and software all I needed was a mini-USB to USB cable. I bought a 5m one from eBay for less than £2. This lets me have a certain freedom from the camera, i.e. I can sit in the car with the laptop or in my shed etc. Sounds like overkill but when the winter comes around and the temperatures drop I’ll be the one sat with a heater on taking pics from the garden shed! In this example I’m setup on a photographic tripod but it would be fine with the camera connected to a telescope or piggybacked. 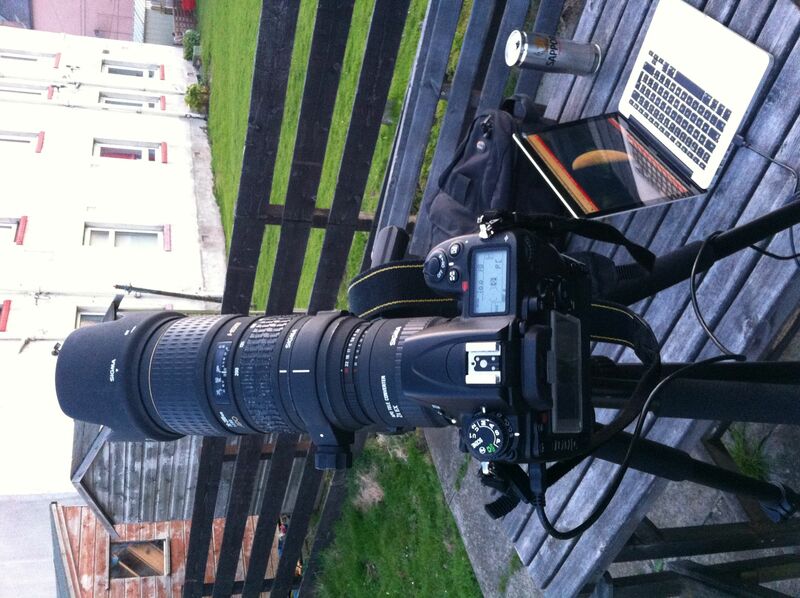 The downside to the photographic tripod is no tracking so you do have to keep adjusting it to keep the moon in view. With the setup done in Sofortbild there’s a live view option so I can see what the live view screen on the camera will see although, bigger on the laptop screen. You can zoom in on this too so you can really nail that focus. Much easier than peering at the 3″ screen on the back of the DSLR. With optimum focus in place now you can take a shot. Within seconds the final image, not a preview, is viewable within the app, you can zoom in and carefully check exposure and focus with much more accuracy than you ever could on the camera preview screen. If you need to adjust all the settings are there in drop down menu’s easily accessible and more importantly, you are never touching the camera at all. 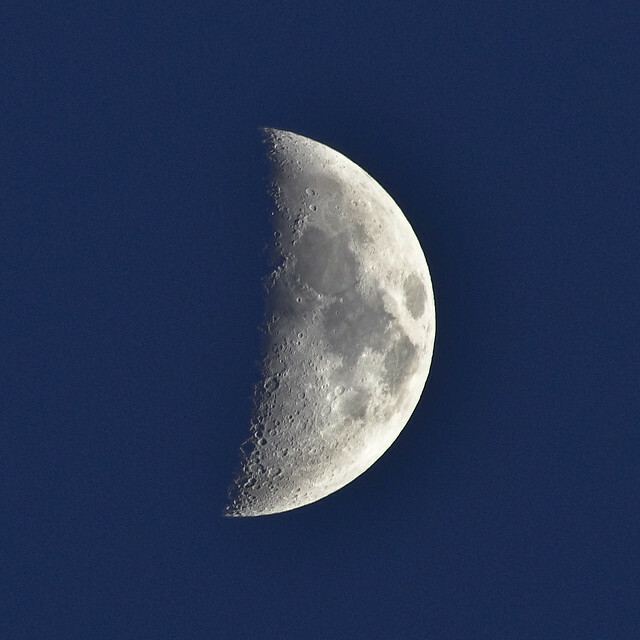 Even at 400mm the moon takes a couple of minutes to travel through the FOV so you have a good few opportunities at settings before you’ll have to adjust the camera’s position. With Sofortbild I can also set it to auto import into iPhoto where I catalogue all my RAW files. All shots are stored on your laptop not on the memory cards which for me is a win situation. At the end of the day all the shots will end up on the MacBook for processing anyway so it cuts out a step of my workflow process. I’ve certainly found this a cheap and highly functional alternative to using a normal camera remote. It might not be suitable in all conditions but if you can use it it will provide benefits the traditional methods won’t. For the outlay of an extra long USB cable it’s transformed the way I’ll be taking astro pics in the future and it’s yet another part of the astro photography learning process ticked off! 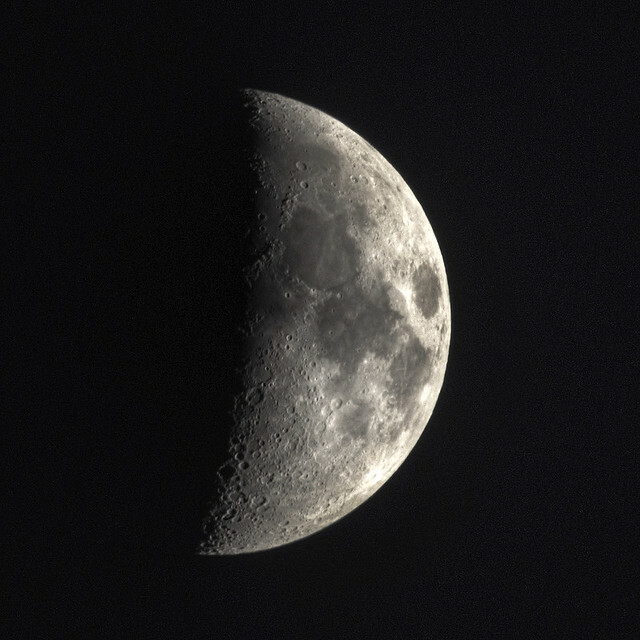 Here are a few shots of the moon taking with this method. This is a blend of 3 exposures blended in Photomatix Pro. 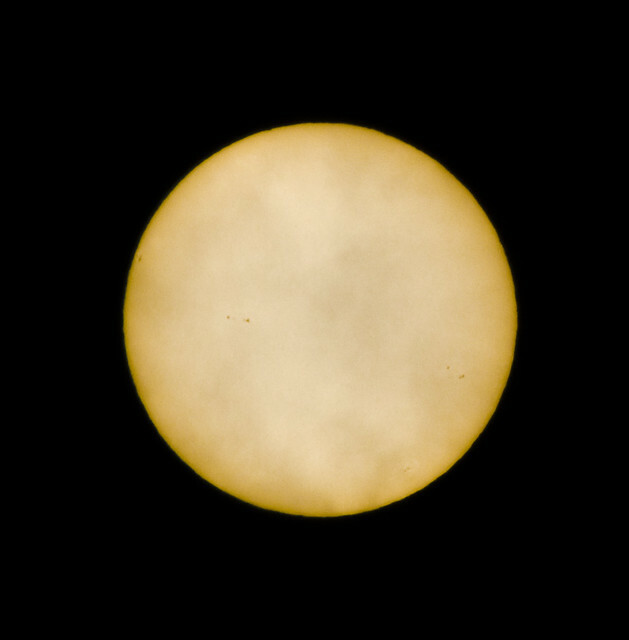 And just to finish with, here’s a shot of the solar disc taken with the same method and setup with the inclusion of a 10 stop filter on the lens. I have to say, the International Space Station is an engaging photographic subject. Hundreds of miles above the planet traveling at 17500mph it wouldn’t be the first thing you’d think of nipping out with the camera to capture. However, once you figure out roughly where it’s coming from, what you’re looking for and when it’ll be there it’s almost addictive. If you happen to be on Twitter try following some of these accounts and you’ll be amazed at how many retweets they send out of images after every visible pass over the UK. Planning for the ISS makes a huge difference. The @VirtualAstro twitter account is a good place to start, there’s a wealth of info for every pass from that particular source. The website, http://www.heavens-above.com is also good for working out the directions, altitude and brightness of the ISS for any given pass. The free astro programme, Stellarium for Mac or PC is also very helpful, it’ll show you the exact path the ISS will take and from this you can work out in relation to the planets where it’ll be which makes planning a lot easier. 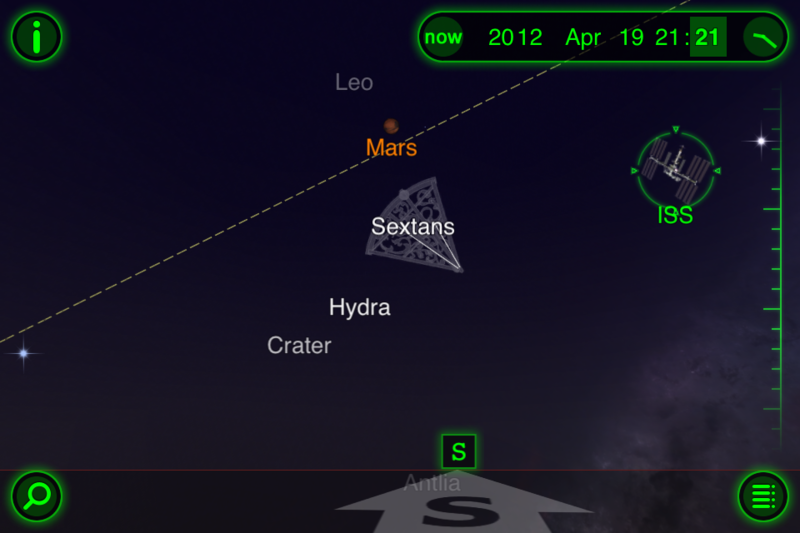 The iPhone app StarWalk also allows you to do this. Here’s a screen dump from Stellarium and from it you can see the ISS path for tonights pass in relation to Sirius and Mars, two of the easier night sky objects to spot. This is a screen dump from the iPhone Star Walk, from here you can see the ISS and you can advance the time with the bar on the right to watch the path it’ll take over the sky. 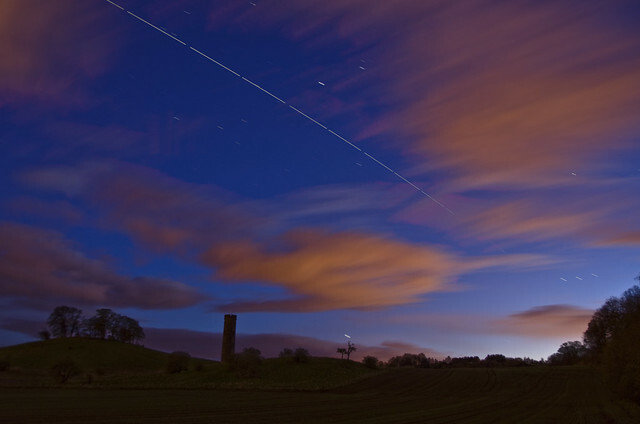 Typically the nearer to sunset the longer the ISS will be visible, approx. an hour to 1.5 hours after sunset you’ll get a very bright pass almost from the western horizon to the east later in the night, it’ll disappear into the earth shadow quicker. So, with this info in mind the temptation is to sit in the house watching the telly and nip out just as it’s about to pass. I’m guilty of it too. But if you apply a little landscape photography principals to the astro info you can totally change the shot you get. The 2nd image took a stack of planning to get. All the info above plus looking at Google maps to find a location with good views to the west, south and east. The only issue I had with this image was the clouds were obscuring Mars so I couldn’t get a reference for how high the ISS would be in the sky, with hindsight I should have used a wider lens but we can all be great in hindsight can’t we? Using Star Walk I figured out roughly where on the horizon the ISS was going to emerge from and composed the shot to catch it as quickly as I could as it rose, also keeping in mind I wanted Cammo Tower and the copse on top of the hill in the shot. Ground was kept to the bare minimum required and the sky was the main focus. The sky was still quite light so I went for a balance to catch the ISS. I used ISO320 and f4.5 and limited the exposures to 10s, this gave a nice balance in the shot but meant enough sensitivity to get the light from the ISS. In the end I got 12 frames of 10s each until the ISS left the field of view, being an early pass I had time to recompose and get another few frames before it disappeared. The 12 raw images I took into ACR and processed them all exactly the same and saved as jpg files. These 12 jpg’s were loaded into StarStax and blended on lighter mode. 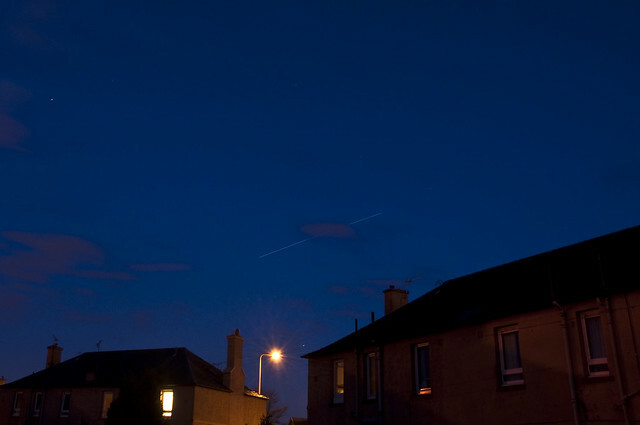 This was fine, the ISS trail was night and bright but the cloud movement was nasty and not smooth. To get around this I stacked the 12 images again using the “average” method which gave a much more pleasing image with the clouds but a faint ISS trail. I then blended the first image into this on lighten mode and decreased the exposure until only the bright ISS trail and stars remained. The resulting image was flattened and tweaked in photoshop to produce the final image. If I were to process again I may patch in the gaps in the trail between the exposures and as a personal preference I would also try to lose the star trails by blending in another image and selectively deleting the trails. With a location like this though and a nice (nearly clear sky) it’s worth taking time for a few other shots before you back up. This was a single from from the composite image. Notable objects in the shot are the ISS, Mars, Regulus, Sirius, and Orion. In this shot, the ISS can be seen behind the clouds passing just over Saturn and Spica. 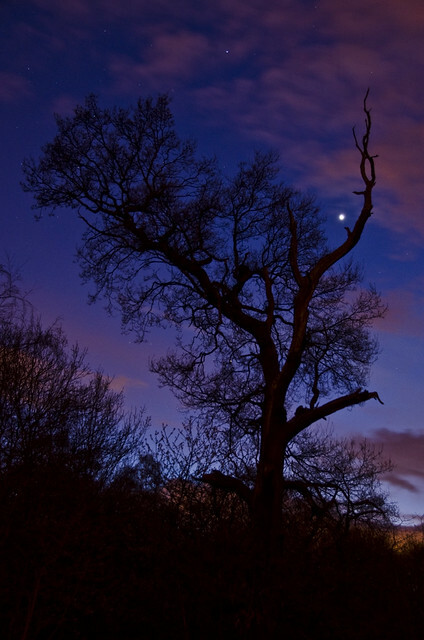 In this final shot taken just after the ISS pass, Venus is nestling on the branches of this particularly creepy tree! A little planning can work wonders, it’s all just about planning and crossing your fingers for the weather to play ball. It won’t work out every night but for that odd one it does you’ll be well pleased you put in the effort. 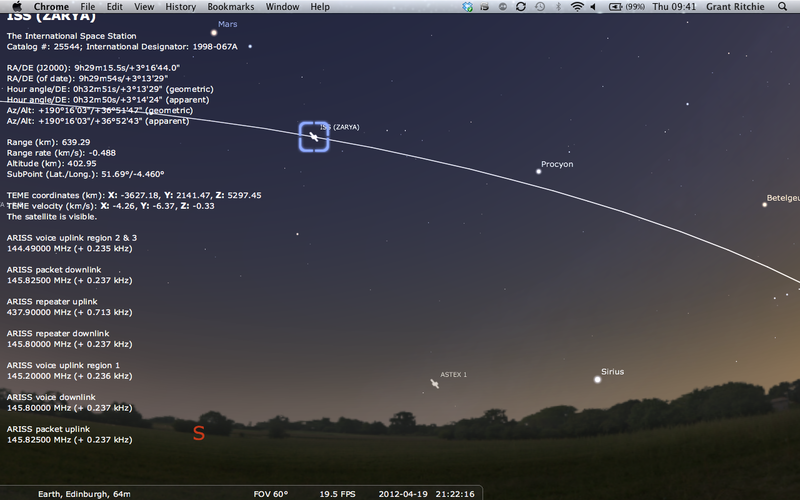 Get out and look up tonight and for the next few nights before it disappears under the horizon for another few weeks! ]It’s been a funny old couple of weeks weather wise in Scotland. We’ve gone from sitting in the garden in shorts and t-shirt to snow, hail, torrential rain and even thunder and lightning. One thing about the Scottish climate, it certainly keeps you on your toes. It’s been a very mixed bag for me photography wise. On one hand for astrophotography I want totally clear skies but for landscape I’d prefer a cloudy sky or at least some clouds in the sky. Clouds give you options, slow the exposure down and you can streak the clouds, or if you’re lucky enough to get huge high contrast clouds it can give a shot real drama. Clouds also help a sunset along no end; a slightly cloudy sky will always yield a better sunset than a clear sky will. The last couple of days though have been really challenging, mainly due to the one thing that can stop play. Rain. Rain can be a real pain in the back end, water on the camera gear isn’t usually desirable although less of an issue with weatherproofed DSLR’s. It’s entirely possible to get some decent shots in rain though, you just need to adapt to the conditions. Remember too, rain can also come with extreme weather and nothing makes a better shot than extreme weather! Certainly though, rain will stop you using filters, unless you want to sit cloning out rain drops on your shots for days on end. In these conditions I find it best to go simple. Shoot handheld, with the lens hood on and just bring the camera out when you want to take a shot. Balancing exposures will of course be an issue but there’s another weapon at your disposal here. HDR. There, I said it. That dirty photography word, HDR. “Stone him” I hear you all cry. But wait! Why not? 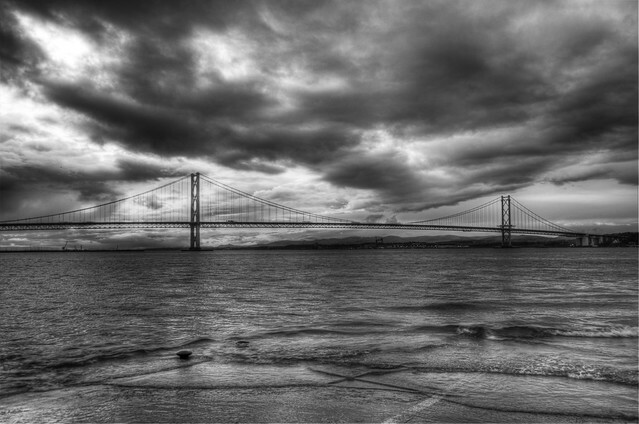 I’ve hardly used HDR for the last 18 months but the last couple of days it’s been a useful style to adopt. HDR is really down to personal taste but if done tastefully then I can’t see any reason why not? 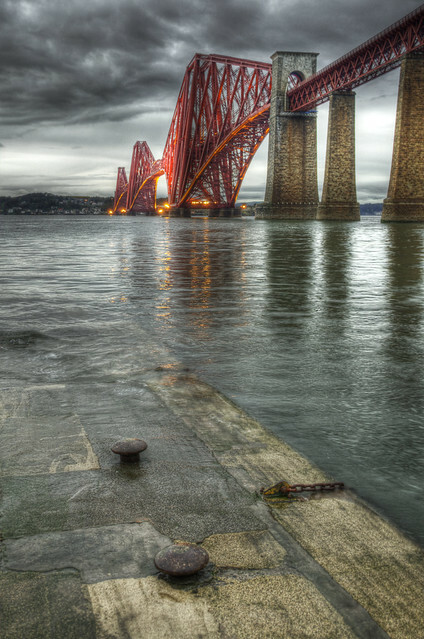 A bad shot will still look like a pile of poo in HDR but a good shot can look particularly pleasing if done properly. 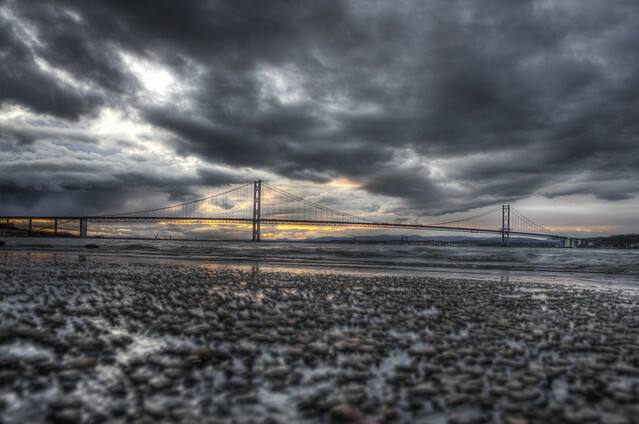 My bad weather method of shooting HDR is as follows. 1. Low as ISO as you can, HDR always works better with a low ISO, I try to stick to ISO200 or lower. 2. Shoot 3 bracketed shots for everything, +2, 0 and -2ev. 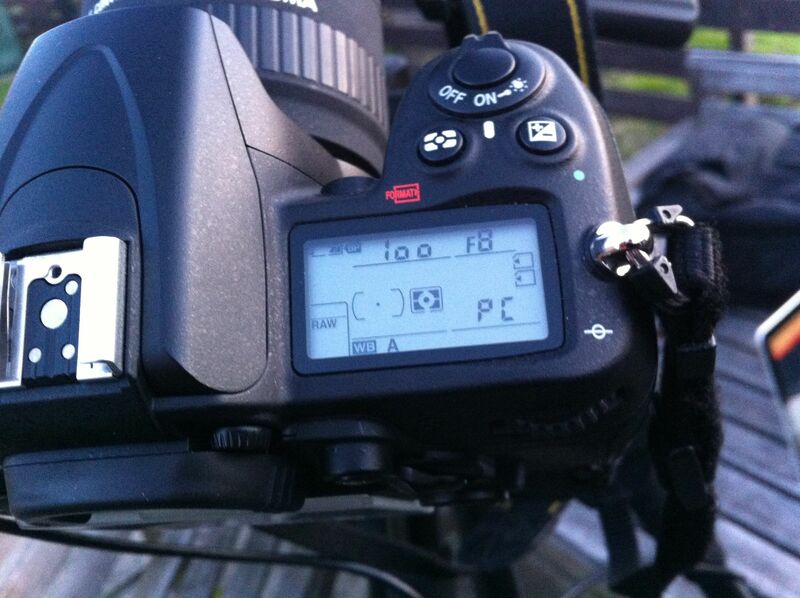 Most DSLR’s have an auto bracketing feature. 3. Turn on your high speed drive and if you have it vibration reduction, image stabilization or whatever it’s called on your camera. 4. Frame the shot, focus and press the shutter until you hear all 3 shots rattled off. It’ll take about as long as a blink of the eye and you should have 3 shots, sharp, bracketed and not that far off the same position. Use features matching in Photomatix when you’re combining the exposures and you should be fine. I like to bump up the contrast in Photoshop of HDR shots after the tone mapping is finished; I feel it gives a cleaner look with more tonal depth. Tone mapped images can look a little bland to me and bumping up the contrast finishes off a shot how I like it. While you’re getting your shots though, do try to keep the lens pointed down when you’re not shooting and keep a close eye open for rain drops on the front lens element. They might not be that noticeable on the preview screen but they’ll be the cause of much wailing and gnashing of teeth if you find them once the pics are downloaded. These shots were all taken in rain the last 2 days using a Nikon D7000 and Nikon 18-200mm VRII lens. All are 3 exposures combined in Photomatix Pro 4 and finished in Photoshop. Stars, Planets, Snow, Hail and Wind! One thing about Astro-photography, you’re totally at the mercy of the weather. No matter what’s going on in the night sky, you can only see it if the clouds let you see it. There’s nothing you can do about it other than cross your fingers and hope that as darkness falls the skies clear. Which predictably they don’t 9 times out of 10. 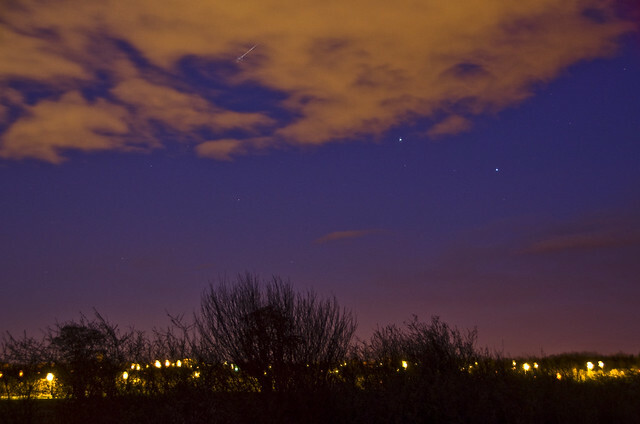 The conjunction of Venus and Jupiter last month being a perfect example. 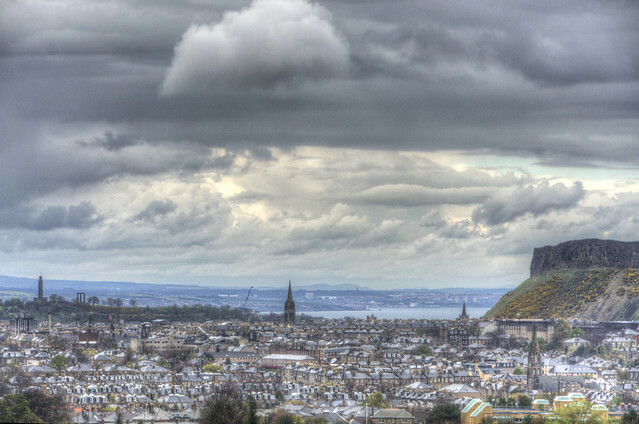 The night the 2 planets were at their closest in the sky thick cloud hung about all night over Edinburgh spoiling the celestial display. With the weather rollercoaster central Scotland was experiencing yesterday I held out little hope of even seeing, let along photographing 2 meetings of night sky objects last night. All afternoon the weather swung from heavy snow/hail showers to broken cloud and back again. As the twilight approached this was still the case so getting anything was going to take timing and a hefty dose of luck. With this in mind, I set up the camera and tripod in the garden shed. This is the kit I’ve been using until I finally get my telescope. 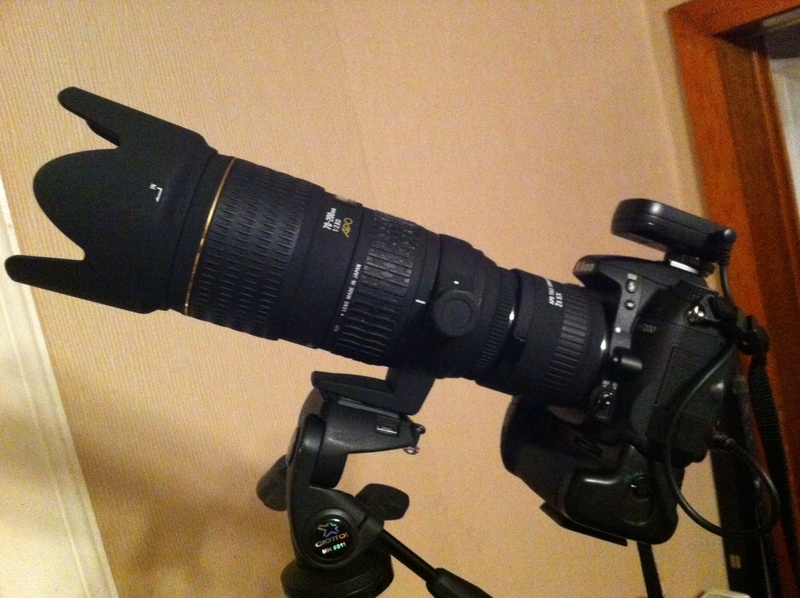 It’s a Nikon D7000, fitted with a Sigma 70-200mm f2.8 EX HSM and 2x tele converter which gives me a 400 f5.6 lens, 600mm on the Nikon crop sensor. The D7000 is fitted with a Hahnel Giga T Pro remote receiver so I can use the powerful IR remote to trigger the camera. Exposure delay mode is on the try and minimise any shake. At 400mm the slightest movement will be obvious, more so when the subject is many thousands of light years away. 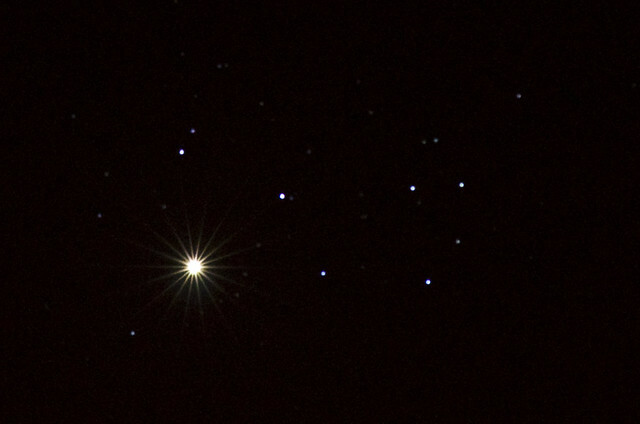 The first object to try for was the conjunction of the planet Venus and the Pleiades open star cluster, also known as M45 or the Seven Sisters. Venus has been steadily getting closer this month and on April 3rd it was sat right on the edge of the cluster to our view. 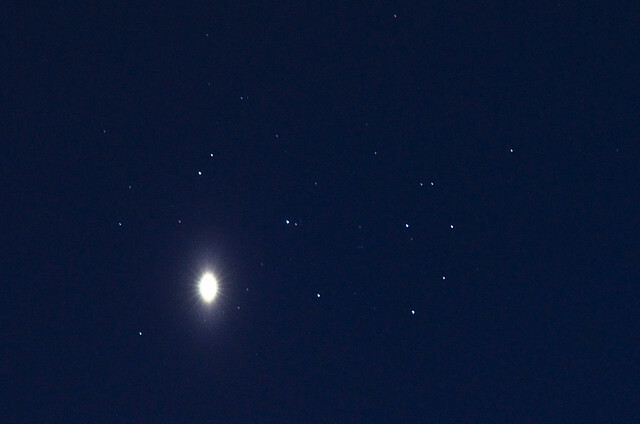 400mm fills the frame nicely and even though M45 wasn’t visible in the twilight sky, the camera could see it. There was just the small issue of the passing torrential hail shower to wait out first. As the dirty ominous clouds passed I got my first few shots at the target which was made difficult with a biting strong wind. 18″ long lens setups and strong winds don’t go too well together. So, high ISO of 1600 and 1s exposure to try and keep the stars as dots rather than oblongs and the full 400mm was the order of the day. The wind affected a lot of shots but this was the pick of the bunch. Venus is of course very bright and the star cluster much dimmer, so I exposed for the stars and let Venus appear as an attractive starburst. Exposing for Venus would leave the stars not visible at all. This shot was taken later on in the night with a darker sky and the 2x teleconverter removed to try and combat some of the “wind wobble”. ISO1600, 200mm and f5.6, 0.8s exposure time. The 2nd object of the night was the close proximity of the Moon to Mars and the star Regulus forming a celestial triangle in the constellation of Leo. The clouds hadn’t parted at all over this part of the sky and it took a while to get any hope of photographing it. With the 2x tele removed due to the distance between the objects around 9.45pm the clouds moved and I got my first shot at the Moon. The final shot had to be a blend of 2 shots, one for the Moon and one for the planet and star. To expose for the very bright Moon left Mars and Regulus nearly invisible, to expose for Mars and Regulus burned out the moon totally and worse still caused huge lens flares. As the clouds rolled over again the final shot of the night was a closer shot of the moon with the clouds looking all atmospheric. ISO800 at 400mm, f5.6 and 1/25th exposure time done the damage. 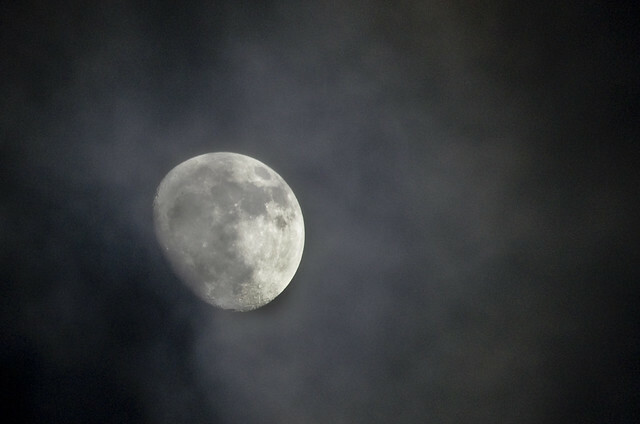 It’s hard to get decent focus with clouds moving over the moon so I consider this a fairly lucky shot. An enjoyable, if cold, night but hammers home the need for a telescope again, even just for tracking purposes it would be invaluable. I’ve pretty much decided on a Skywatcher Explorer 150p Newtonian on an EQ3-2 mount which I’ll fit with the optional motor drives. Hopefully I’ll have it soon when the real fun and steep learning curve will start.